Design II look like the stock injectors with a plastic upper, and a metal lower, but instead of a pintle, they use a disc and have 4 holes for better atomization. 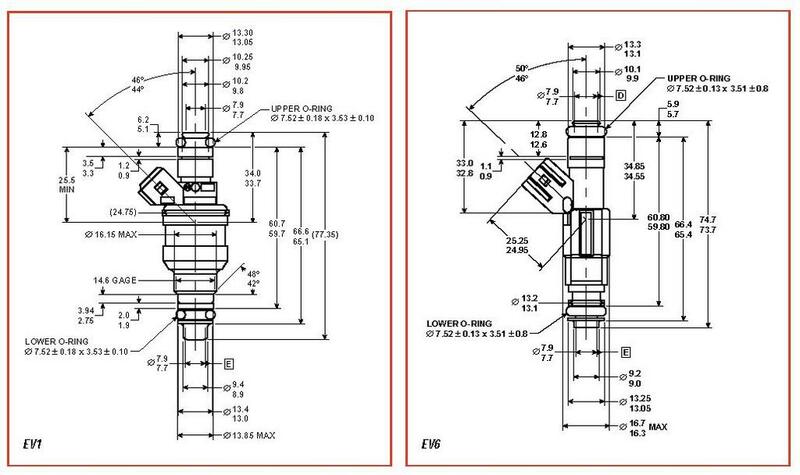 Handily, both Design II and Design III injector body types have 4 holes, so I can ignore the old original Bosch design pintle-style injectors with their pencil stream of liquid fuel. I'll be buying some 30lb injectors - for a very lightly modified 5.0L NA.. just modified S3 cams, X-pipe, and maybe GT-style port-matched intake manifold if I can be bothered (I have a sharktuner too). So, is it worth modifying a set of design III's to fit over just buying some design II's? Last edited by Hilton; 04-11-2011 at 03:16 AM. Interesting videos. In the last one it appears the design III and the pink top design II have a pretty similiar spray pattern while the yellow top doesn't seem to atomize quite as well. 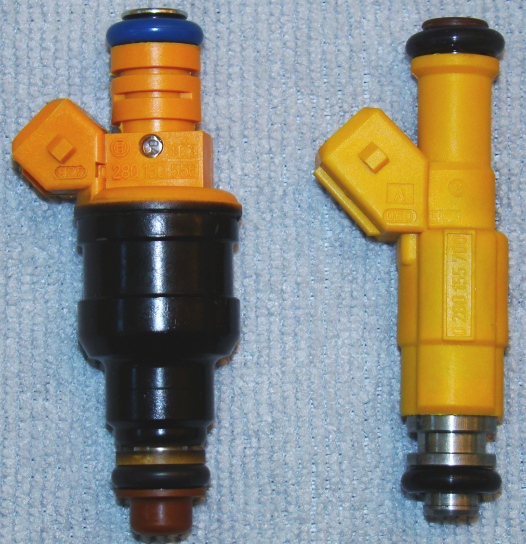 I assume these are rebuilt and aren't new injectors so I wonder if the yellow top has more mileage than the pink top since they're both design II type and should have the same pattern. I don't think you're going to notice much difference in noise from the type II vs III since they're both disc type vs the pintle type which was noisy. A good site for comparing injector output and resistance based on bosch part # is http://www.polog40.co.uk/article_injector_table.php. 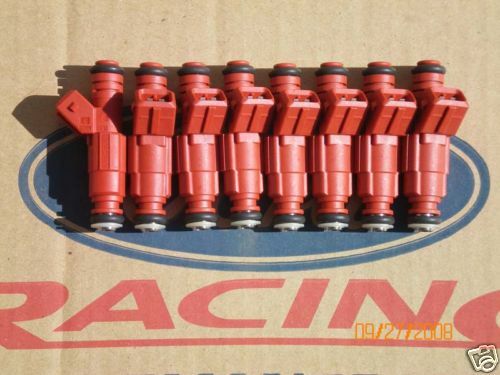 It shows our stock 19# injectors, 0280150730, flow 201 CC/Min at 3 bar with 15.9 ohms resistance. Good site to use for ebay purchases. a few others have used these and if things are just right the injector can come loose from the rail and fuel will spill and this will cause a fire, the injector will slide down into the manifold. Agree stan - however a few rennlisters have used a dremel to cut grooves on the design III injector to allow it to use the stock clips to hold it in the fuel rail. I've installed type III in my 85. 24 lbs injectors. I used an old lathe to cut the clip slots in mine. Worked flawlessly. But if you look at the yellow III from the first post and compare it to the black III in post 4 you will notice a design difference in the top half of the bodies. The black design matches the ones I cut and installed, but the yellow ones don't appear to have the constant diameter upper which allows the addition I'd the clip groove. But if you look at the yellow III from the first post and compare it to the black III in post 4 you will notice a design difference in the top half of the bodies. The black design matches the ones I cut and installed, but the yellow ones don't appear to have the constant diameter upper which allows the addition I'd the clip groove. Thanks for stating the obvious, I'd completely overlooked it. Now that you mention it, I did some looking and there's a few types of "design III" bodies. The three attached pictures below are all 24lb Design III inhectors, all with different arrangements of grooves (note the greeny-blue ones are EV6 connectors - just included them as an example of grooves). Interestingly, FiveO advertise the pink ones as being suitable for 85/86 928S. From a look at those pics, I'm wondering whether the red ones are a direct fit on S4's and include the groove for the clip? 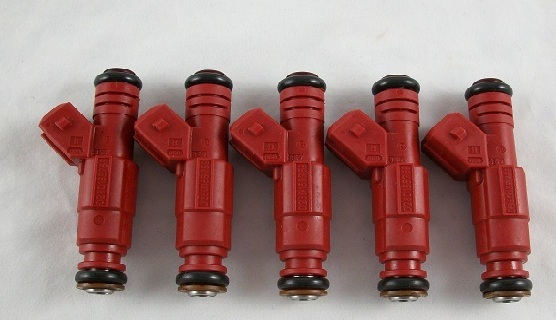 Has anyone used Design III injectors in an S4 that didn't require modifying to use the fuel rail clips? I went to 4 hole type II's 2 years ago when doing an Intake R&R and also didn't replace the fuel rail covers. I've noticed no discernable noise increase from those changes. A good site for comparing injector output and resistance based on bosch part # is http://www.polog40.co.uk/article_injector_table.php. 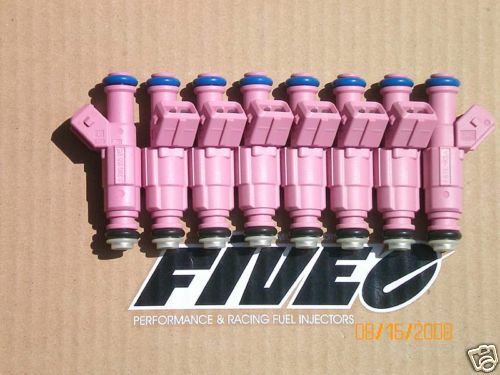 It shows our stock 19# injectors, 0280150730, flow 201 CC/Min at 3 bar with 15.9 ohms resistance. Good site to use for ebay purchases. Interesting videos. In the last one it appears the design III and the pink top design II have a pretty similiar spray pattern while the yellow top doesn't seem to atomize quite as well. Yep, in the first video, I'm pretty sure the design II and design III are injectors no. 4 and 7 respectively. Both open fast, and atomise well, but there is a minor difference in the spray pattern. Anyone with a stock injector to hand who can measure the distance to the clip groove from the top of the injector? All my stock ones are in cars at present. Then I can check photos online to scale (I have a used 19lb design III injector here on my desk to measure, to scale a photo correctly). The fall-back is just go with the 4-hole design II's, which is hardly a bad outcome, but I may as well go with the slightly newer technology if I can find a good fit. I've got my old stock ones under the house in storage - Won't be back home untill Friday night, but happy to measure them then if no one responds in prior to that. Just brainstorming, it might be possible to take a plastic ring, groove it, split it, and epoxy it to the body of the III. I've got my original 24 lb injectors out of my 85 I can measure if that will work for you. I would think they would match dimensionally but don't know for sure. just let me know and i'll go out to the garage and grab one and the caliper. or this may have what your looking for. if there is anything in addition just specify an I'll try to get you the numbers. Looks like the groove is 1mm thick and it's between 9 and 10mm from the top. I looked at several other videos comparing the design II vs design III and the spray pattern is definately better with the III. One also commented that the IIIs were much quieter than the IIs. There was also one that increased the pressure slowly up to 120psi and the pattern stayed perfect. Seems we need to figure out a design III plug n play option. A quick search between working and checking the news turned up these as a likely 30lb injector.. They're 30lb (315cc) and have the additional grooves, high impedance (14.5 ohms). 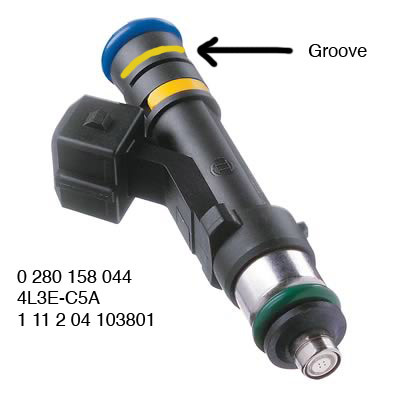 The top groove starts at 9mm from the top of the injector and is 1mm wide (i.e. ends 10mm), and the second grooved slots (not a complete circumference) start at 12.5mm down. Looking at Simon's diagrams above (thanks Simon), the lower groove on a design III is at 12.6-12.8mm, and the upper groove is at 8.6-9.5mm on a design II so my measurements are close enough to be useful. I'm guessing its a tolerance range on the diagrams. 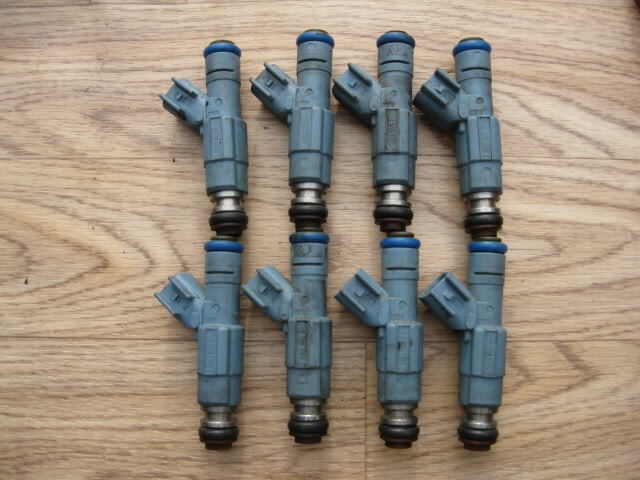 So.. all that remains is to confirm the grooves on the injectors are as shown in the photo, and track down the best price I can find for a new set. Last edited by Hilton; 03-17-2011 at 06:20 AM. If anyone wants to add to the list feel free to post and I'll add them - if you've got actual fitment experience even better If I get time in the next few days I'll try and add some bosch numbers for Design II injectors (old body style with 4 holes) - as there's no list of them on this forum either. Last edited by Hilton; 03-18-2011 at 07:29 AM. isn't the fuel rail bolted down? Can't remember. But if it were, would there be a need for fuel rail clips?? If the o-rings at both ends are large enough (meaning snug) the injector will stay in the bung and stay in the rail (provided it was bolted down).